The old-school sound strikes back as TRAUMA, the eighties-troubadours of thrash have unveiled a new album. “As The World Dies” is the classic format given a well deserved boost of energy, moving with the times but keeping the nuts and bolts of the metal machine oiled, driving forward with the same intensity as they in their first incarnation. That said the opener “The Rage”, gives the listener a blast of strings before the full assault of TRAUMA kicks in and is fully recognized for the heavy beast that it is. “From Here To Hell” keeps the chunky-guitars pulsing loud and fast, although at times the excitement of speed becomes a greater vocal point than the themes of the songs. This is a band who have bypassed any influence from the nineties, from either grunge or the alternative, early millennial sounds. This is a valid point which stands to TRAUMA, within the material is a sound which is fresh, though rooted firmly in the past. “Gun To Your Head” is a distorted playground of chaos, whereas the in-your-face collage “Last Rites” sees TRAUMA mellow with their unique version of a ballad. They are never running at pace that slows or, dare I say it-soft. Though from the start this album seems to be an more confident and honed affair than their last-“Scratch and Scream” in 2015. 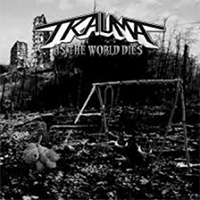 The band has shook off the re-emergence nerves and are pushing forward to break-new ground as TRAUMA regain their foothold and serve their brand to a new audience. A back and forth of acoustic and electric guitars on “Run For Cover”, does not fall into the cliched category, instead it is an almost standout on the album, it does take more than a single listen to get fully involved with this band though it is a worthwhile experience. Helped on by the vocals of Donnie Hillier, which are at times astonishing, and a vibration of BLACK SABBATH is both unexpected and clear in “Asylum”. Similar to the title track it is doom-laden though remaining entertaining and accessible, likeable. As the ten-track barrage comes to a close with “Savage”, you are feeling that TRAUMA has accomplished far more than just an excellent album, here they have clearly shown that even in these modern times, old-school bands can cut it and release quality metal as good as the new breed.